1. 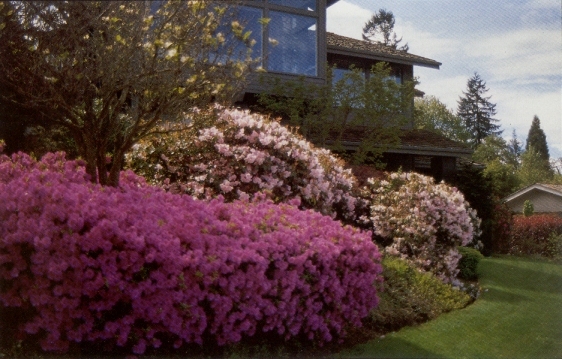 Rhododendrons and azaleas flower on the prior year’s wood. In other words, the buds for spring flowering form on the plants during the previous summer or fall. If you prune in the late summer, fall, or winter you may be trimming off your flowers for the following spring. 2. 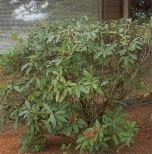 With the larger leaved rhododendrons (lepidotes), you must prune just above growth joints. Each year as the plant starts to grow there is a visible point where the plant started growth. We call this point a growth joint. Prune just above this point, because that is where the dormant growth buds are located. Don’t prune between joints, because there are no dormant growth buds in that area. 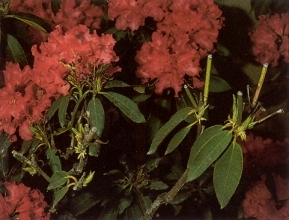 However, with azaleas and the small leafed rhododendrons (lepidotes), you may prune anywhere along the stem, though you may not be able to see them, these plants have dormant growth buds nearly everywhere. 3. Generally prune right after the plant is through flowering. Light maintenance pruning will not affect flowering for the following year if done as directed. 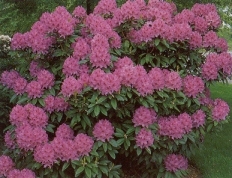 Cutting back a rhododendron heavily can stop the plant from flowering for a year or two. 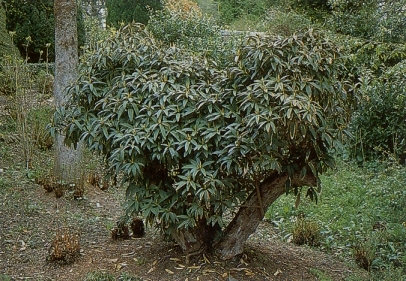 The pictures below show heavy pruning of a dense plant, cutting it back to a smaller size, but still leaving some prior year’s foliage and maintaining an even shape. Note the plant flowered the following year, though not as heavily. 4. Even very large plants can be cut back severely to stumps with no leaves. They will recover, though it will be a year before the plant has much foliage and two or more years before they flower. 5. As a plant grows, some of the inside limbs will be shaded out and become weak and die. It is a good idea to remove these, plus other weak limbs that are on the ground or crossing over each other. This provides better air circulation and does not provide a place for insects and diseases to start. 6. Evergreen azaleas can be sheared for hedge or border. Unlike rhododendrons, evergreen azaleas can be sheared each year after flowering to create a dense rounded plant. Deciduous azaleas can be cut anywhere on the stem and they will branch from that point, though they should not be sheared as severely as evergreeen azaleas.